The Challenger Deep in the Mariana Trench is the deepest known location in Earth's oceans. Mariana Trench map: Map showing the geographic location of the Mariana Trench in the Pacific Ocean. Image from the CIA Factbook. The Challenger Deep in the Mariana Trench is the deepest known point in Earth's oceans. In 2010 the United States Center for Coastal & Ocean Mapping measured the depth of the Challenger Deep at 10,994 meters (36,070 feet) below sea level with an estimated vertical accuracy of ± 40 meters. If Mount Everest, the highest mountain on Earth, were placed at this location it would be covered by over one mile of water. The first depth measurements in the Mariana Trench were made by the British survey ship HMS Challenger, which was used by the Royal Navy in 1875 to conduct research in the trench. The greatest depth that they recorded at that time was 8,184 meters (26,850 feet). In 1951, another Royal Navy vessel, also named the "HMS Challenger," returned to the area for additional measurements. They discovered an even deeper location with a depth of 10,900 meters (35,760 feet) determined by echo sounding. The Challenger Deep was named after the Royal Navy vessel that made these measurements. In 2009, sonar mapping done by researchers aboard the RV Kilo Moana, operated by the University of Hawaii, determined the depth to be 10,971 meters (35,994 feet) with a potential error of ± 22 meters. The most recent measurement, done in 2010, is the 10,994 meter ( ± 40 meter accuracy) depth reported at the top of this article, measured by the United States Center for Coastal & Ocean Mapping. Challenger Deep map: Map showing the location of the Challenger Deep on the southern end of the Mariana Trench, south of Guam. NOAA image modified by Kmusser and used here under a GNU Free Document License. The Challenger Deep was first explored by humans when Jacques Piccard and Don Walsh descended in the Trieste bathyscaphe in 1960. They reached a depth of 10,916 meters (35,814 feet). In 2009 researchers from Woods Hole Oceanographic Institution completed the deepest dive by an unmanned robotic vehicle in the Challenger Deep. Their Nereus robotic vehicle reached a depth of 10,902 meters. Why is the ocean so deep here? 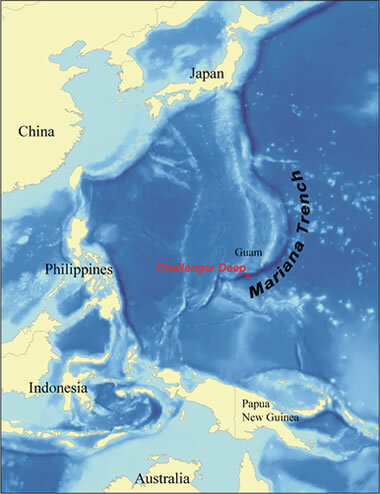 The Mariana Trench is located at a convergent plate boundary. Here two converging plates of oceanic lithosphere collide with one another. At this collision point, one of the plates descends into the mantle. At the line of contact between the two plates, the downward flexure forms a trough known as an ocean trench. An example of an ocean trench is shown in the diagram. Ocean trenches form some of the deepest locations in Earth's oceans. 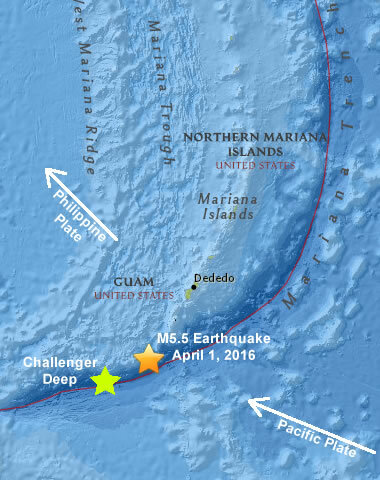 Mariana Trench earthquake: Map showing the location of the Challenger Deep, the epicenter of an April, 2016 earthquake, and the relative movement directions of the Pacific and Philippine Plates. USGS map with annotations by Geology.com. Underwater volcanic vent: As the Pacific Plate is pushed into the mantle and heated, water in the sediment is volatilized, and gases are liberated as the basalt of the plate melts. 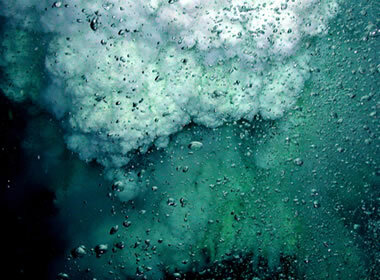 These gases migrate to the surface to form a number of volcanic vents on the ocean floor. This photo shows gases escaping and bubbles moving towards the surface, expanding as they ascend. NOAA image. The Mariana Trench occurs along a plate boundary between the Philippine Plate and the Pacific Plate. The Pacific Plate is on the eastern and southern side of this boundary, and the Philippine Plate is on the western and northern side of this boundary. Both of these plates are moving in a northwesterly direction, but the Pacific Plate is moving faster than the Philippine Plate. The motion of these plates produces a convergent plate boundary because the greater speed of the Pacific Plate is causing it to collide into the Philippine Plate. This collision produces a subduction zone at the Mariana Trench as the Pacific Plate descends into the mantle and under the Philippine Plate. This collision occurs at variable speeds along the curving boundary of the plates, but the average relative motion is in the range of tens of millimeters per year. Recurrent earthquakes occur along this plate boundary because the Pacific Plate's descent into the mantle is not smooth and uniform. Instead, the plates are usually stuck with pressure accumulating, but with sudden slips as the plates move a few millimeters to a few meters at a time. When the plates slip, vibrations are produced, and those vibrations travel through Earth's crust as earthquake waves. As the Pacific Plate descends into the mantle, it is heated by friction and the geothermal gradient. At a depth of approximately 100 miles, the rocks have been heated to a point where some minerals begin to melt. This melting produces magma that rises towards the surface because of its lower density. As the magma reaches the surface, volcanic eruptions are produced. These eruptions have formed the Mariana Island Arc.